DIVERS searching for the wreckage of the crash AirAsia passenger jet may be no nearer to finding its crucial black box flight recorders, officials say, even if they have located the body of the plane using sonar. Five large objects have been found at the bottom of the Java Sea about 90 nautical miles off the coast of Borneo, and experts believe them to be parts of the Airbus A320-200 that plunged into the sea on route from Surabaya to Singapore last Sunday. At about 18 metres long, the largest piece suspected to be the fuselage of the plane - but bad weather and strong currents have prevented searchers from making the relatively shallow 30-metre dive to verify this. Fransiskus Bambang Soelistyo, the head of Indonesia's search and rescue agency, said the focus now was to reach that fuselage, where many bodies could still be strapped in to seats. "Our priority is to dive in the location we suspect parts of the plane to be," he said. But Soelistyo said none of the ships searching the area have detected any "pings" - locator signals sent out by black boxes in the event of a crash. 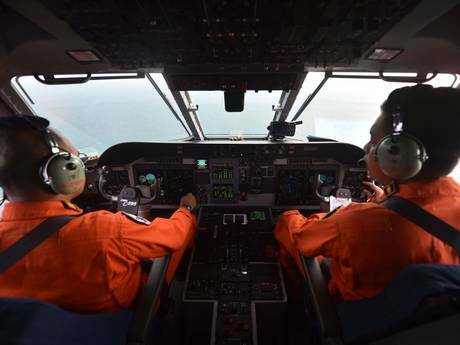 The flight recorders store critical data from the plane's diagnostic systems, as well as up to two hours of audio from the cockpit, and represent the best chance for investigators to determine what happened to flight QZ8501. Air Force Lt Col Johnson Supriyadi, a search and rescue official co-ordinating the operation, said it now looked like the boxes, located in the tail of the plane, had broken away from the rest of the wreckage. "Based on the finding of pieces of debris it looks like the body of the aircraft split or cracked and was separated from its tail," he said. Until the black boxes are found, the cause of the crash remains a mystery. BMKG, Indonesia's meteorological agency, has said bad weather may have caused ice to form on the aircraft's engines. "The flight document provided by the BMKG office shows fairly worrying weather conditions for the aircraft at cruising level on the chosen route," the agency said in a 14-page report. Search teams have recovered 34 bodies from the 162 passengers and crew on board the plane in eight days. The airline has come under pressure from Indonesian authorities, who have suspended its Surabaya to Singapore operations saying the carrier only had a licence to fly the route on Mondays, Tuesdays, Thursdays and Saturdays. Indonesia AirAsia said it would co-operate with the transport ministry while it investigates the licence.